If you’re keeping tabs on real estate news, you know we’re in a low inventory housing market. There are fewer homes for sale and the competition for the best homes can be fierce. For the first time in years, bidding wars are making a comeback in many markets. Despite these challenges, now is still a great time to buy a home. Interest rates are low and prices have yet to skyrocket back to where they were in 2005 when things were really booming. But how do you make a smart move in a low inventory housing market? Tired of losing the bidding war battle? Build from the ground up! 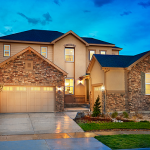 You can choose your floor plan, choose your homesite and watch your home go up from start to finish. Homebuilders usually sell homesites on a first-come basis, so the day you contract is the day you reserve your plot of land. No more worrying if another buyer is going to come in with a better offer. Plus, many floor plans have options for personalizing the layout with extra bedrooms, a study or a finished basement. So you can buy a home and make it fit your lifestyle! Think about hiring a contractor. Even in a low inventory housing market, there are houses that stay on the market for months. A strange layout or outdated décor can keep a home from selling in any market. But if you love the neighborhood, consider buying the home and making the updates yourself. Who knows, with the money you save by buying “the dud,” you may be able to have the kitchen remodeled, replace the orange carpet and add an extra bedroom. Make your offer stand out. For many markets, gone are the days when you could tour a resale home, take a week to think about it and then come in with an offer thousands below the asking price. Depending on the state of the industry where you are, if multiple offers have become the norm, you may want to present your best number right away. Plus, have your real estate agent find out from the seller’s agent what types of things might tip the odds in your favor. Did the family already move across country? Putting in for quick closing date may give you an edge. You may also consider including a handwritten letter with your offer. Telling the seller that the home is two blocks from where you grew up or you can’t wait to see the peony plants bloom in the spring will give your offer a human touch. It doesn’t work every time, but it may be worth a shot!